Do not miss out this incredible opportunity to replace or stock up on these lamps! Regularly at $12.95, get them this week with a wooping discount of almost 25%! Offer available only for 5 days! 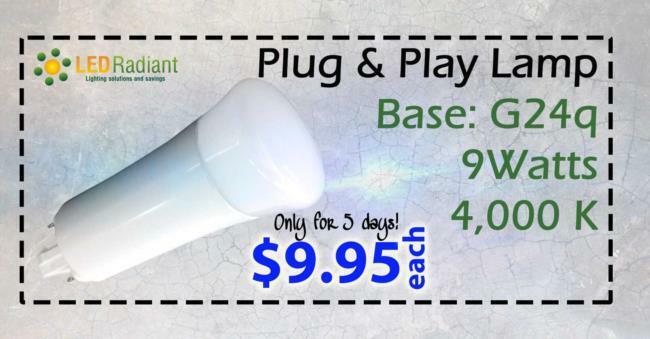 Our 9W PL Lamps, ballast compatible (Plug & Play), with a G24q base are so good that we want you to have a chance to have them at an incredible discounted price! 9W LED replaces up to 27W of the old CFL's lamps and lasts 25 times longer. Take advantage of this flash sale price only untill Sunday. All our products have a 5 year warranty. Orders received before 2:00 PM EST are shipped the same business day, orders received after 2:00 POM are shipped the next business day. When you buy from LEDRADIANT.COM, you can rest assured that your products have been designed, tested and guaranteed. However, if you decide to return for any reason, please note that all returns must be made in original sellable condition, including all related materials within 30 days from the shipping date. Â©2017 LEDRADIANT. All rights reserved.